When sixteen year old Kyra Agnew wakes up behind a Dumpster at the Gas ’n’ Sip, she has no memory of how she got there. With a terrible headache and a major case of déjà vu, she heads home only to discover that five years have passed... Yet she hasn’t aged a day. Confused and lost, Kyra isn’t sure how to move forward unless she uncovers the truth. With Austin gone, she turns to Tyler, Austin’s annoying kid brother, who is now seventeen and who she has a sudden undeniable attraction to. As Tyler and Kyra retrace her steps from the fateful night of her disappearance, they discover strange phenomena that no one can explain, and they begin to wonder if Kyra’s father is not as crazy as he seems. There are others like her who have been taken... And returned. Kyra races to find an explanation and reclaim the life she once had, but what if the life she wants back is not her own? Kyra doesn't remember much from the night she and her father, her number one fan, fought, that she asked him to stop the car on the desolate road that night. Kyra and her father were arguing about her future, namely her boyfriend Austin and the issue that the two have never spent time apart, when a bright flash of white light and fireflies diminished any further memory of what happened. Kyra wakes up behind a dumpster at the local convenience store, and with no memory how she got there, makes her way home... Except it isn't home any more. Five years have passed, and now twenty one year old Kyra hasn't aged a day. The only person she can rely on is Austin, but it isn't Austin's arms she finds herself in, it's little brother Tyler. Now seventeen, Tyler isn't the annoying twelve year old boy that Kyra remembers, not that she remembers much at all. No one knows what happened to Kyra, not her parents or the authorities. Her dad has a theory, and has spent the last five years delving into the world of alien abductions that has consumed his life. But the life Kyra once knew is no longer her own. Austin and her best friend are now an item, living the college life that Kyra and Austin had planned together, her parents are divorced and her mother remarried, giving Kyra a new sibling that she feels had replaced her. But the biggest change in her life is her father and his alcohol fueled conspiracies. But as she enlists Tyler's help to find out what happened to her, what she discovers may put both their lives in danger. Kyra is one of The Returned, taken against their will and placed back into their lives with no memory of exactly what happened. Teens are taken, and those who return aren't the same as the kids who were taken. They haven't aged, but have been enhanced. They're also now wanted by the National Security Agency. But what makes these teens so unique? 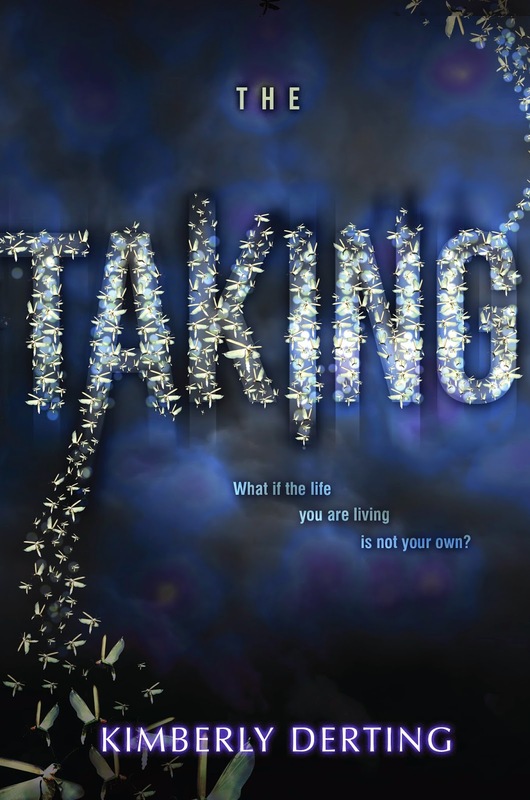 The Taking was even better than I had anticipated, considering most of the early reviews I had read weren't so favorable, usually that's a sure sign that it'll be something I'd enjoy. It wasn't the characters, although Tyler was adorable, it wasn't the theme as aliens have been covered time and time again. It was the intrigue. I love a good mystery and The Taking provided me with a fun and entertaining storyline, in which the reader will discover Kyra's world just as she does. With caution and skepticism. I really enjoyed the scenario that Kimberly Derting created, teens taken, returned and left to wonder why. I enjoyed both The Pledge series and Body Finders and yet again I've found another Derting series that I'll be eagerly awaiting. But there are a standout issues with the storyline, the romance between Kyra and Tyler. The last time Kyra had seen Austin's younger brother, he was only twelve years old. Now he's seventeen, she's twenty one but hasn't aged a day over sixteen and within days, she's fallen in love. Umm, no. It's creepy. The other being Kyra's refusal to accept that Austin and her best friend are now together. I understand that she's only sixteen both mentally and physically, but surely she couldn't have expected her friends and family to not go on with their lives and the only reason she seems to come to terms with what she feels is Austin's betrayal, is Tyler. Even though she seemed to fight the attraction, the romance fell flat, not only due to the disturbing age difference before Kyra was taken, but she replaced the one she couldn't have, with the brother who was conveniently there. But regardless, it was brilliant. I really enjoyed it and look forward to the next installment in the series. Hehe Kelly you do seem to enjoy some of the books that others don't, and that's a great thing because it gives a different perspective. the whole thing with Kyra's little brother is really, really weird and I've read a lot of reviewers who couldn't get around that. Lovely review! I totally do Jeann. I think it's the troublemaking dystopian lover in me. Glad you enjoyed this one so much! I've read a mix of reviews so we'll see how I like it.The romance definitely sounds cringe worthy. I have a big issue with age differences in real life so this is like my worst nightmare LoL. It wasn't the age difference exactly, but more so that when the MC last seen the love interest before she was taken, he was only twelve years old. Now that she's returned, he's seventeen and in only a matter of days, she think she's in love. How can she not still see him as the annoying twelve year old? If you love a mystery and adventure, then you'll really enjoy it Zoe. I tended to deliberately forget about the issue surrounding the romance, it was so much easier to get into the storyline after that. I love my romance but creepy romance is not better than none! I’ve seen some unpossitive reviews for this but I’ll definitely give it a go now! Thanks for a great review Kelly!